When a homeowner calls us about a roof leak, we always ask the same few questions to try and determine what kind because not every leak is a problem. Of course, roof leaks are always inconvenient but they are not always signs of a larger issue of say missing shingles or an unsealed vent. A very common type of leak is from wind driven rain. We often get perplexed customers wondering why they are getting leaks after a mild storm when there were no previous issues or red flags. 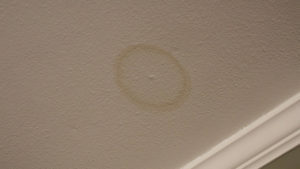 Your roof has been in perfectly fine condition for years, but one day you suddenly notice a damp spot forming on the ceiling. A calm rain occurred a few days ago, but why now? The answer; wind driven rain. What does that mean? Wind driven rain is rain propelled by wind and it often blows horizontally. This may create water intrusion that would otherwise be impossible at a regular rainfall angle. Even though the storm might have seemed like a gentle rain, the wind was still likely causing it to blow into the crevices of your roof. Your roof is designed to shed water downward, not from the side. A wind driven rain at the perfect angle can create leaks your roofing system isn’t designed to prevent like in the picture below. 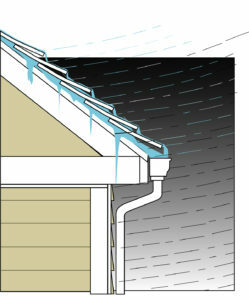 You most likely have a leak caused by wind driven rain if your roof does not leak in every rain storm. If you had a true problem with your flashing or shingles, it would leak every time and it would most likely leak in the same spot too. If you are not sure, you can always give us a call! We are happy to give our opinion or even come out and take a look. Wind driven rain is not usually something to worry about as it is rare and not an indicator of a bigger problem in you roofing system.